In this week’s installment of the HJ News and Resource Roundup we’ll be discussing the implementation of the ACA and the challenges immigrant families will face, disparities in health for people of color, last week’s mom-led rally at North Central Bronx Hospital, and more. October 1 is only 4 days away! Millions of Americans will be eligible to purchase health insurance through their state’s marketplaces (aka exchanges). However, many consumers, especially immigrants, will face barriers to accessing care through the marketplaces, including language barriers and confusing eligibility rules. Here’s a handy FAQ on eligibility for immigrant families. In a blog post, Marielena Hincapie from the National Immigration Law Center applauds the law for bringing millions of uninsured out of the shadows, but draws attention to the millions of undocumented immigrants that are left behind. A new study finds racial and ethnic disparities in pain management and length of stay among children treated in the ER for abdominal pain. A recent report draws connections between geography, income, and access to health care. Brooklyn hospitals find temporary reprieve from closures, but many systemic problems remain to be addressed. 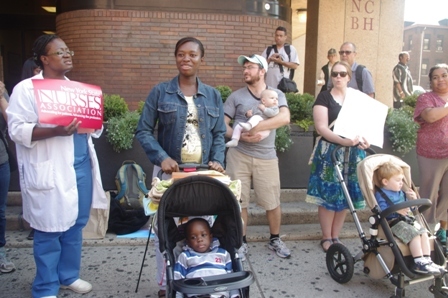 Last week, moms, nurses, doctors, community members, and advocates rallied at North Central Bronx Hospital to keep labor and delivery services open. In this week’s installment of the HJ News and Resource Roundup we’ll be discussing access to physical education in NYC public schools, immigrant access to health care, disparities in health care for people of color and LGBTQ individuals, the implementation of the ACA, and more. We’re in the news! A NY1 exclusive quotes our very own Jennifer Swayne and showcases her work to pressure the Department of Education to share school-by-school information on gym classes NYC public schools. Access to physical fitness programming in schools may promote student success. First Lady Michelle Obama has launched a new campaign promoting water as vital to health and wellness. Some, however, feel that the campaign does not go far enough. Food access for low-income families is threatened under looming cuts to SNAP funding. In some good news, one study shows teenagers are exercising more and making healthier food choices. Our very own Shena, Director of the Health Justice program, recently testified before the New York State Assembly Committees on Health and Insurance and the Task Force on New Americans in the hearing on the New York Health Benefit Exchange and its impact on immigrants and their families. You can read her testimony here. This handy guide provides a basic overview of how the ACA will impact immigrants. Advocates are still pushing for immigrant inclusion in health care. HJ Community Organizer Sascha Murillo talks about the suspension of labor and delivery services at North Central Bronx Hospital and the impact this will have on moms in the North Bronx. Asian American teens may face cultural challenges in the diagnosis and treatment of mental illness. Meanwhile, half of Asian American teens in NYC report having experienced bias-based bullying, which may lead to depression and anxiety over time. New research provides insight into ways to reduce racial disparities in diabetes mortality. Transgender writer and activist Janet Mock discusses the importance of trans-inclusive/affirming health care. An interview with education reform advocate Diane Ravitch explores the connection between failing education systems, poor health outcomes, race, and poverty in the US. The most recent US census reveals interesting data on health insurance in America. Racial justice advocates are worried about the limits of Medicaid expansion and what that means for low-income folks of color. Meanwhile, some hope for even broader solutions in a single-payer approach to health care. The White House hopes to expand outreach to LGBTQ communities under the ACA. The ACA will also make health care more affordable for people who lose their jobs. Continued Republican attacks on the ACA will harm low-income communities. Reopen Labor and Delivery at North Central Bronx Hospital! Sharifa Kamga is 32 weeks pregnant with her second child. Until recently, Ms. Kamga was planning to deliver her baby at North Central Bronx Hospital (NCBH). In 2012, she delivered her first child at NCBH and was delighted by the care she received from the midwives there. But due to the recent suspension of Labor and Delivery services at NCBH, Ms. Kamga now must change her birth plan for her second child. After receiving a call in August informing her she would have to deliver at Jacobi Medical Center, Ms. Kamga will be forced to travel farther to get the care she needs. Concerned about inadequate staffing and patient safety at Jacobi, the Health and Hospital Corporation (HHC) decided to suspend Labor and Delivery (L&D) services at NCBH and transfer all L&D staff to Jacobi, leaving Ms. Kamga—and many women like her—distressed and fearful. 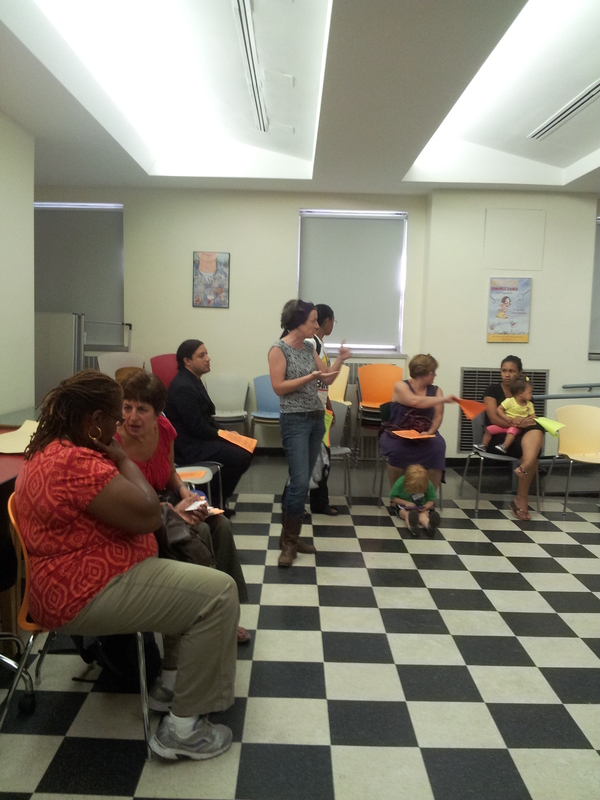 Eileen Markey from Community Power North Bronx speaking to a group of moms about the closure of L&D at NCBH. Several aspects about the decision are troubling. Patients and NCBH staff were only given three days’ notice of the change. Additionally, many advocates are concerned that Jacobi does not have the capacity to serve the influx of new patients previously served by NCBH; in 2011, NCBH delivered 1,647 babies, which is quite the patient caseload to add to Jacobi’s 2,072 deliveries in the same year. Even with the added staff from NCBH, Jacobi will struggle to accommodate the increased patient volume. But what is most troubling is that this closure is part of a larger pattern in New York City of cutting health care services in underserved communities. Until recently, Interfaith Medical Center and Long Island College Hospital, two financially struggling hospitals that serve predominantly low-income and immigrant communities of color in Brooklyn, were slated to close. Throughout the city, it is not uncommon for health services to be concentrated in wealthier neighborhoods, and for service providers in low-income areas to face financial hardship or closure. Accordingly, people of color overwhelmingly make up NCBH’s patient population, and a significant proportion of that population speaks a language other than English at home (in 2012 alone, NCBH provided nearly 30,000 interpreter sessions in 72 languages). The closure of L&D services at NCBH, then, would adversely impact a community that already faces disproportionate rates of pre- and post-natal complications: Bronx communities have poorer maternal and infant health outcomes than the rest of NYC, and a report from the Bronx Health Link documents disparities in infant mortality, maternal illness and mortality, and access to prenatal care. Advocates and hospital watchdogs have reason to be alarmed, pointing to the impact of previous cuts to care services in the North Bronx. In 2009, NCBH suffered a dramatic loss in services and midwives, which undermined the award-winning midwifery practice at NCBH. Having had the lowest rates of cesarean sections in the city in 2008, the North Bronx has since seen C-section rates skyrocket by 90%. “These are families,” says Ms. Kamga. “This is not about numbers. You are actually displacing families whose lives will be affected by this one decision. It’s a big deal.” Further cutting services at NCBH will disproportionately harm women and infants in the North Bronx and only exacerbate existing disparities in both access to care and overall health. It is imperative that the L&D services at NCBH remain open and accessible to North Bronx residents. To voice opposition to the closure of L&D services at NCBH, moms in the community, health advocates, and health providers will be rallying in front of North Central Bronx Hospital this Friday, September 20, at 11 AM. Please join us to demand that HHC reopen L&D at NCBH. You can also sign our petition here. In this week’s installment of the HJ News and Resource Roundup we’ll be discussing immigrant access to health care, hospital closures, the importance of physical education programming, and more. A new study has found that Latino-American children are more likely to face multiple barriers, including language access issues, to autism screening and diagnosis, leading to disparities in care. Across the country, states and community groups are grappling with how best to provide information and care under the ACA to Limited English Proficient individuals, a diverse group who speak a variety of languages. NYLPI’s HJ team is inspiring language access campaigns across the country! The University of New Mexico is hosting a congressional summit on racial and ethnic health disparities. The lack of physical education programs in public schools could have an adverse impact on students, including decreasing grades. In New York City, lack of access to physical education and public park space disproportionately impacts low-income students of color. The state of North Carolina is planning to provide fiscal compensation to the people of color, low-income people, and people with disabilities who were targeted for forced sterilization by the state’s eugenics program. The New York Times provides a more in-depth look at the hospital closure crisis in Brooklyn, which is will have a disproportionate impact on low-income people of color. But in breaking news, a Brooklyn judge has ruled to halt Long Island College Hospital’s (LICH) closure. The decision may impact future hospital closures in the area. A major part of the technology that will be used to allow people to shop for health insurance plans online, known as the “data hub,” has been completed. Meanwhile, some states are enacting restrictive and ill-advised policies that may inhibit the efficacy of ACA navigators. Navigators are community-based entities and individuals that will help consumers with their questions about the ACA and assist them in enrolling in coverage through the state marketplaces. The expansion of Medicaid under the ACA is expected to benefit states’ homeless populations. Private, non-profit health insurance co-ops created under the ACA hope to give big commercial insurers a run for their money. In this week’s installment of the HJ News and Resource Roundup we’ll be discussing immigrant access to health care, the suspension of Labor and Delivery services at a Bronx hospital, children’s access to mental health services, and more. With implementation of the Affordable Care Act in full swing and Congress’ return to discussions around immigration reform, it seems that there is growing interest in the issue of immigrant access to health care. Kaiser Health News and the Seattle Times jointly reported on the many challenges that immigrant families will face in navigating the new requirements and eligibility restrictions under the Affordable Care Act. Encinitas Patch is running a Q&A series to help immigrant families understand what they qualify for, and this week they explained how undocumented parents can enroll their citizen children in health coverage. A physician in California argues for Congress to remove restrictions in accessing health care under current immigration reform proposals. 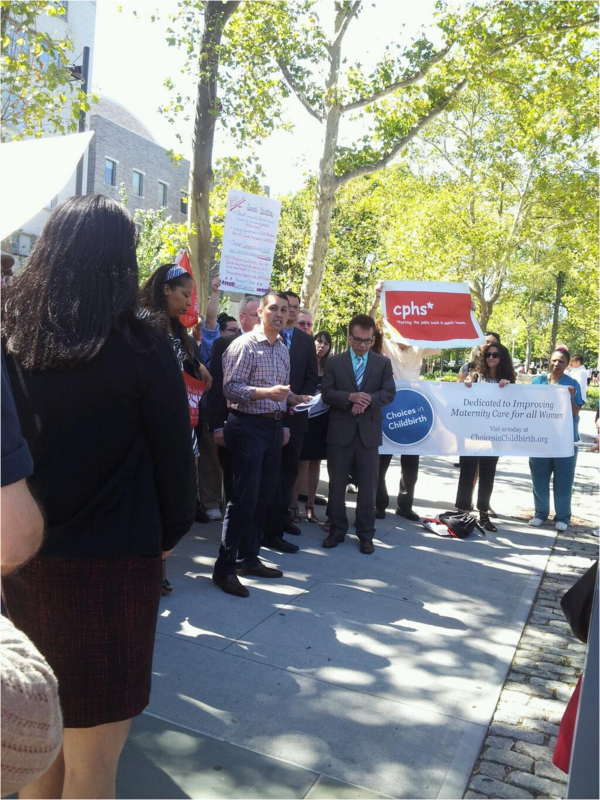 This week, the HJ team, along with the Commission on the Public Health System, New York State Nurses Association, Choices in Childbirth, and other partners, held a press conference in front of Jacobi Medical Center to reopen Labor and Delivery services at North Central Bronx Hospital (NCBH). On August 12, the Health and Hospitals Corporation (HHC) suspended Labor and Delivery at NCBH and transferred all staff to Jacobi. Several individuals spoke out against HHC’s decision and emphasized the negative impact that the closure will have on North Bronx moms and babies. Please sign the petition to reopen vital maternity services at NCBH. Mayor Bloomberg announced the opening of the Engagement Center in Harlem. The goal of the center is to address the problem of truancy (unauthorized school absence) among students in the area, and will offer mental health services to students who come to the center. Washington State is fundamentally changing the way it provides mental health services to children on Medicaid. Following a class-action lawsuit filed in 2009, the state has agreed on a settlement, which calls for intensive in-home and community-based care. The goal of the program will be to keep children out of the foster care system and inpatient treatment centers. A new study looks at racial disparities in nursing homes, and finds that low-income African Americans fare worse than other races. The study points to poorer quality of care at Medicaid-reliant nursing homes as a contributor to the disparity. And finally, the Equity of Care collaborative has released a new guide on collecting patient race/ethnicity/language data to reduce health care disparities.